I finally finished putting away stuff in the basement at 9 last night. I baked the cookies in the morning while it was still cool. I decided to cut some pieces with a new die that I purchased. 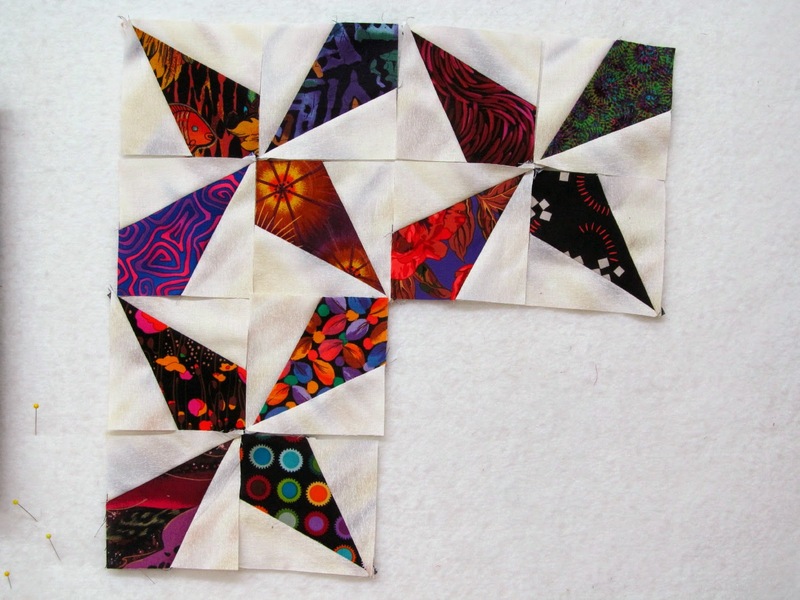 I had a pile of leftovers from the Fractured quilt so that is what I used. 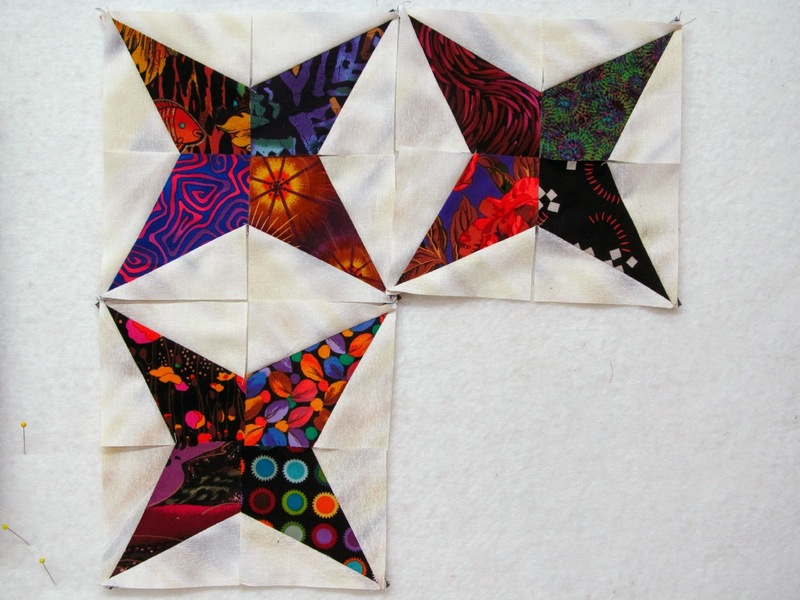 I have just sewn the quarters, not the whole blocks. I wondered what would happen if 2 of the pieces were turned the opposite way. This might be interesting if you made the diagonal paths in different color groups to create a sort of plaid look. 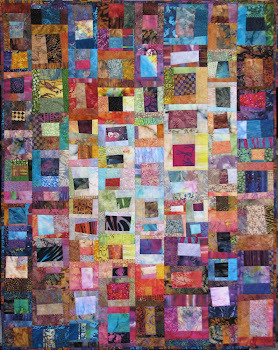 Added at 8 a.m., go to Gene Black's blog and see the EQ colorations he came up with!! I'll have to play with it later, the art quilters are coming today and it is supposed to be above 90 degrees. Doreen Speckmann called this unit "Ice Cream Cone", if memory serves. Lotta seams at those junctions! I don't envy you those. 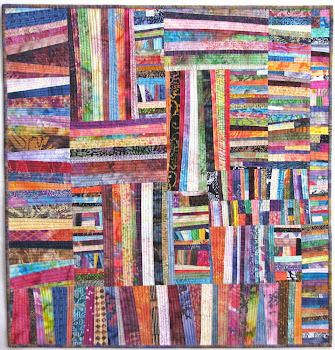 Can't imagine how much fun it would be to be an art quilter at your house! I certainly hope it does not get to 90 or above. Interesting design you showed. Sewing it is probably tricky. I love playing "what if" I may put that in EQ and see what happens. beautiful both ways. Keep playing - it is the fun part. What was the name of the new die? Is it available for the GO? Thanks. Oh Wanda ~ just love those new blocks...like schards of cut glass in a kaleidoscope. I know you will enjoy your group today even in the hot temps, I magine your basement is cool. The middle bit looks like a friendship star, I really like the blocks switched. I cannot make my computer connect me to Gene Black's blog and would love to see the colorations. This is probably my weak internet connection, I often have to go back on Bloglovin and double click with real purpose to encourage it to open on the blog and not just leave me looking at a blank page!